CMC's versatile services are designed to meet or exceed your recovery goals. We know you want to save time and money. Every day CMC assists a wide variety of businesses by streamlining receivables and reducing operating expenses. 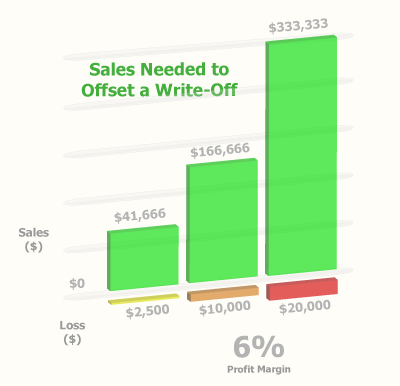 This graph shows how small write-offs cost a comparatively large amount of sales profit to be offset. At a margin of 6%, your business will need to generate almost $50,000 in sales to offset a small loss of $2,500. We recognize that there is no room for risk in your business, which is why CMC takes a different approach. First, we provide a range of powerful collection tools. Second, our innovative services will save time, increase your cash-flow and reduce your collection placements. Third, you'll be backed by an influential, reliable agency capable of tackling your most complex collection issues.